← Graphic Novel Review: Martin Luther King, Jr. 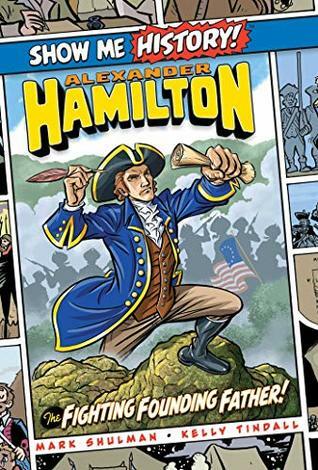 This graphic novel follows an overview of Hamilton’s life, his service in the Revolutionary War, and his involvement in constructing the financial laws of the new American government. It’s difficult to squeeze an entire life into 96 pages, and I thought the balance of story-telling could have been better. Interesting parts of Hamilton’s military career were skimmed over, and a lot more time was dedicated to his political battles to establish a federal government with a national currency, etc… I thought the book would have been more engaging if they had spent slightly less time on the politics, since it doesn’t have as much action. The art style is cartoony and bright, with a lot of funny details in the background. The art is unpolished, and I think it could have been a little more refined. But still, it’s cute, and the panels have lots of energy. I was interested to see that this biography doesn’t ignore the ugly things in Hamilton’s, like his sad family past and his cheating on his wife. The book mentions them briefly, and even makes jokes about them, then moves quickly to the next subject. I don’t think it’s appropriate to make a joke in a children’s book about adultery, but I do think it’s good that they include Hamilton’s faults to show that he was not a perfect person, maybe not even a good person. The subjects weren’t badly handled, but they weren’t exactly handled well either. There are several little historical jokes that are hidden in the artwork and text. For instance, there are posters on the wall of the Pennsylvania State House (where Congress wrote the Declaration of Independence) that say “Silence!” and a poster of Ben Franklin saying, “Do Good!”. It’s a joke about the Silence Dogood letters that Ben Franklin wrote and published in a newspaper. But if you didn’t already know that little tidbit of history, the joke would fly right past you. So there were a few things in the book that didn’t make sense to me, because I guess I just don’t remember those little anecdotes from history. For instance, young Theodosia Burr asks her father for a glass of water. This is odd because she has very few bits of dialogue in the book. She’s a very minor character. So why waste an entire panel on a little girl asking for water? I had to look her up to find out that she was lost as sea later on when she was 29. So I suppose it’s funny to reference water in connection with her? Doesn’t seem that funny. More like tragic. Or maybe it’s a reference to her father’s Manhattan Water Works company that served as a front for his new bank? That might make more sense. I enjoyed reading this sketch of Hamilton’s life, but I think it could have been better organized. I think they were trying to cram so much information into a small amount of space that it didn’t flow as smoothly as it could have. Still a good book for ages 7-17.